This is part two of an interview with German journalist and model Anabel Schunke. Part one, about the effects of migrant crime on Germany’s women can be found here. Anabel studied political science and history and is active on Twitter and Facebook. Germany accepted more than a million migrants. Why did the Germans let it happen? It didn’t look like a very democratic decision? No, it was not a democratic decision and Angela Merkel was criticised in hindsight by parts of the media. The biggest problem was that it was a creeping development, the extent of which the majority of Germans only became aware when it was too late. The decision of Angela Merkel from September the 4th 2015, was sold as a humanitarian state of emergency. You have to imagine: The mood in the summer of 2015 was a kind of welcome culture, which was exaggerated to the extreme by the media in Germany. We had the situation between Angela Merkel and the crying Palestinian refugee girl Reem, who burst into tears on TV because Merkel told her that not everyone could stay in Germany. That message shocked our population. 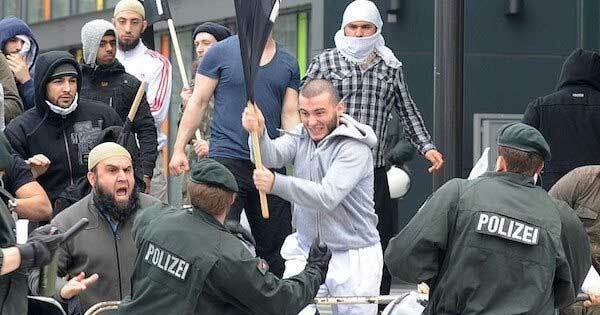 Merkel herself did not act on humanitarian grounds when she decided to let these people through to us. She thought it was an opportune way to supplement her image given the current mood in the country, which was very pro-refugee. Many people, including me, thought it was the right decision in this exceptional situation to allow a limited number of people to come here for a short time. Nobody guessed that this “state of emergency” would become permanent, not even the Chancellor and the government itself. Die Welt journalist Robin Alexander revealed in retrospect in his book “The Driven” that the government wanted to introduce border controls after one week. The soldiers and federal police were already prepared. Everything was aimed at closing German borders in mid-September and not letting anyone in anymore. The only reason that didn’t happen was that no one in the government wanted to take responsibility for the decision and the “ugly” pictures that would have been made. In retrospect, Angela Merkel then made it look as if she was acting out of conviction and stood behind this decision for “humanitarian reasons”. In truth, the government had lost control and does not want to admit it. Worse is that the open border policy continues. 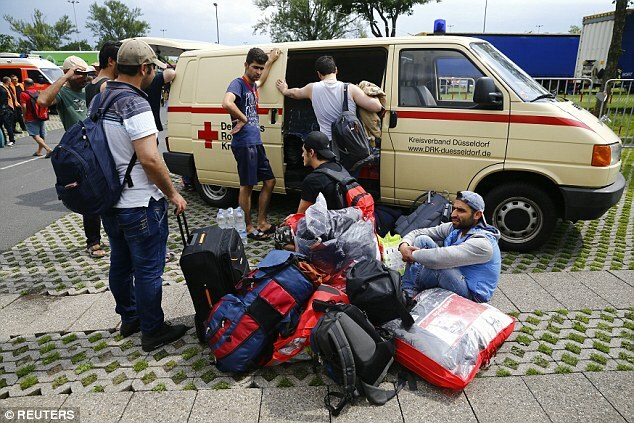 There are still 15,000 migrants coming to Germany every month. If Hungary, Austria and other countries did not protect their borders, we would be utterly overrun. The Germans themselves never had the opportunity to vote on this decision that would change the whole country. Not even parliament was questioned. Angela Merkel has clearly broken her oath of office to avert damage from the German people. Most people don’t understand why a lot of Germans voted for Merkel again. Can you explain us why this happened? The main problem with this misery is that in Germany, unlike in the United States, we have no term limitation. Angela Merkel has governed this country for 12 years now. When she was elected as Chancellor for the first time, I was only 17 years old. So she is almost my entire adult life in office. With the generation after me, it is even worse. But also many older citizens cannot seem to remember a time before Angela Merkel. This is the power of habit and the own inertia that plays a role here. Many cannot remember that her first win was a marginal one. In the following years, she profited greatly from the decisions of her predecessor Gerhard Schröder. That’s what made her so overpowering. Schröder’s “Agenda 2010” to reform the labour market, was, in my opinion, the last decision of a German politician that was designed for a long-term improvement of our country’s economy. It was not focused on a short-term success that guarantees a re-election. Schröder knew that the success of this reform could only take shape after his term in office. It came as it had to come: He and the SPD were punished for the supposedly anti-social “Agenda 2010” and Merkel reaped the fruits in the coming legislature. Unemployment fell and the economy grew steadily in subsequent years. That earned Merkel the reputation of the “Mutti” (Mother). She became known as a woman who stands for safety, stability and for making things easy. The Germans love nothing more than security and stability. Angela Merkel has taken away from them the burden of having to deal with politics. That still pleases many. In truth, she has never done anything but managing and waiting for the successes of previous decisions to materialize. Only three times in 12 years she has made decisions herself – always with fatal consequences. The European Euro Rescue Policy, the phasing out of nuclear power and the opening of borders. The latter actually cost her votes in the last general election. The CDU scored its worst result since 1949. Nevertheless, there’s the advantage that the true extent of their wrong decision making will only become fully apparent in the next few years. The Euro Rescue Policy will cost us billions, as well as the phasing out of nuclear power. Uncontrolled migration will completely divide this country and lead in the long term to the collapse of the welfare state and internal security. You know, most Chancellors get issued bad marks during their tenure. Their decisions usually only receive the appropriate appraisal after their term of office. With Angela, it will be the opposite. How trustworthy is the German media? Do they represent the truth in your opinion? In Germany, the term “lying press” has been circulating since about 2015. I consider this description inaccurate because it implies that the media deliberately spread fake news. But we do have a completely different problem here in Germany. Not so long ago, a representative survey revealed that more than 70% of German journalists regard themselves as more politically left. Most are voters of the Greens, a party with members that left the socialist SPD and which are considered as more ideologically left. As a result, we neither have a journalism that deliberately spreads lies or is controlled by “evil forces,” but a journalism that simply works according to its own political agenda of its journalists, who act more as political activists than as neutral reporters. The decisive factor is not whether it is reported, but also how. 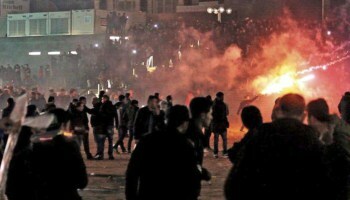 Massed sexual assaults by mobs of migrants took place in Cologne over New Year’s Eve. An example: It took an unbelievable four days until the major German media reported on the massive sexual offenses in Cologne on New Year’s Eve 2015/16. At first, only regional media had taken up the topic on the sidelines, after it already had been reported on 01.01 in Facebook groups of eyewitnesses. Only when it couldn’t be avoided the Cologne story was reported nationwide. Do you know why that took so long? Because media professionals were more concerned about the possible conviction of migrants by the public than about honestly reporting in the spirit of the victims. They knew that it could overturn the mood of the euphoric, unrestricted welcome culture of migrants into the country. Of course, there are also in the public-law entanglements, dependencies with politics, but primarily it was the own worldview of the journalists, that made the coverage so different. And of course, the coverage did not come out without comments on how the population would react to that. Jan Fleischhauer, a well-known German columnist once called this form of reporting “educational journalism”. That hits the bull’s eye. It is a kind of “supervised reporting”, which we experience here in Germany. The citizen will be told immediately to report how he has to think about it. Like in the small Rhineland-Palatinate town of Kandel, where a 15-year-old girl was murdered by an Afghan who, like many others, was most likely younger than he is reported, then the media and politics are particularly interested in the case not to be “exploited by the right”. These priorities are derived from one’s own left-wing worldview, which cannot be what should not be. This determines the way HOW is reported and, of course, this affects a large part of the population. A message that is hyped by the media as a scandal is perceived differently than a message that is relativized or hardly mentioned. People are mostly upset about what the media is reporting as something exciting. That’s why #metoo was a bigger topic than the basic misogyny in Islam ever was in this country. That’s the big failure of the German media. But something is slowly changing. People increasingly see through this type of reporting. As a result, a number of new media emerged, reporting critically and steadily growing, while the established media lose more and more influence. This is a chance and a risk at the same time because of course a lot of garbage is being told on the internet. But it puts pressure on the established media and that’s good. The private broadcasters and some newspapers report much more critically than two years ago. Only the public-legal ones are incorrigible, but they are also financed by a compulsory levy and are thus not exposed to the free market. We’ve had some problems with Germany’s censorship laws. What’s your opinion on them? Reality is overtaking the leftist ideological dream of a growing segment the population, the media and politics at a breathtaking speed. While one is still relativizing the recent murder of a migrant, as happened recently in a small German town, the next one is already happening. More and more citizens wake up and realize that something is totally wrong here. They realise something has gone wrong, that can’t be easily changed now: It’s now also not “an over there problem”. The anger at the conditions that prevail here in this country is growing day by day. It’s not just attacks. It is also the daily unequal treatment of natives and migrants. Germany is a bureaucratic hell. For neo-liberals like me, it is something like a socialist mecca. As a normal citizen, you will be persecuted for double parking. Meanwhile migrants with 14 different identities in Berlin, in public places with knowledge of politics and police, continue undisturbed with dealing drugs. The citizen feels meanwhile that the legal system in this country erodes, that not all people are treated the same. That he is worse treated than migrants who trample on our helpfulness. Who are kidding and exploiting the German state and us from beginning to end and, on top of that, committing crimes? You know, in Germany we have the second highest tax burden of all OECD countries and while we were told for decades that there is no money for the rehabilitation of schools, the digital infrastructure, tax relief for families and other things. But suddenly this money would be thrown out and distributed to migrants who, under current law, are neither entitled to asylum nor have they ever paid into this pot or will pay into it. This rightly increases the anger of many citizens of this country who feel they are being sold out. This anger manifests itself mainly in the social media, as one is afraid of being overwhelmed by greater protest, e.g. on the street, to experience professional and personal disadvantages. That’s when NetzDG came into play. If reality does not fit in with your own worldview and an increasing part of the population is expressing their displeasure or using their social media platform to clarify what has gone wrong here, then you make sure that these unwelcome opinions become invisible by Banish them and those who spread them from public discourse. One must really wonder how little Germany has learned from the history of National Socialism and the GDR with their Stasi spies. It is therefore important to note that this law is not about erasing criminally relevant content, but rather about disagreeable opinions that mainly cover asylum, migration and Islam. It is an attack on freedom of expression and nothing else. Take a look at German Facebook groups of Muslim migrants from Turkey and other Islamic countries. There you see expressions like “Jews back into the gas” and nothing happens. While people like me are being banned for publishing a sexual harassment of a migrant, or call the burqa a bag, these people may continue to spread undisturbed their criminally relevant content. The only reason this law exists is because of the taboo of discourse on immigration and Islam.